Today seems like a perfect day to celebrate weirdness. More often than not, I am described as weird, not to mention my musical tastes. There is a rich bounty of amazing music in the world these days, partially because of Al Gore's second most famous invention, the Internet. There is a lot of weird in the world today. Look no further than a friggin' ice storm in Boise, Idaho. Seriously? Must I go on? Well, I'm not going to because I have some weird music to share with you today. Weird music, weird album title, weird cover art. 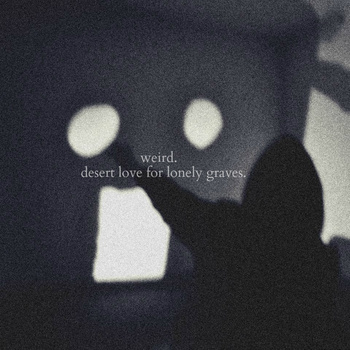 "Desert Love for Lonely Graves" has it all. Italian shoegazers Weird have released their brand new album, available for FREE download on their bandcamp page. Since I'm a huge fan of free music, I just had to check them out, despite what I view as somewhat shoddy cover art. Sometimes cover art is not a good descriptor of the music in an album. This album cover screams lo-fi bedroom pop, but the music is much better than that. "Desert Love for Lonely Graves" is almost purely a shoegaze album with the obligatory nods to standard-fare indie rock added for good measure. If not good, this album is great. The first few tracks of this release are warm indie rock tunes with underpinnings of solid atmospheric reverb and looped vocals. The last few tracks virtually explode with long, slow tempo shoegazing tones that are at times reminiscent of late post-rock. Although the music is indeed weird, it is not too weird. In fact it is nothing rivalling the artist we profiled here yesterday in terms of the weirdness scale. At least one of the first few tracks seemed iffy to me, but I found myself digging the album more and more as it went along, culminating in the breathtaking final track. You have to forgive me for using a 'digging' reference in describing how much I enjoyed this album. As a matter of fact, I didn't even realize what I had done until it was on the page, and when I write something fabulous unintentionally I have a certain penchant for leaving it on the page.